These were the words uttered by me in between laughter, and so started our long night of turmoil.. But allow me to make a case for myself, The fun was worth all the hassle we went through. So, fast forward to Sunday. We're 2 17 year old guys sitting around, bored and broke.. And i say, "hey.. lets go rally in the the pine barrens!" he, being equally stupid and thrill seeking, helped me find the nearest park to us and we we're off! In no time, we got in the area and randomly saw a sign saying "Brendan T Byrant state park" we immediately turned into the dirt nirvana and were flying through the roads, he drove down the main road a bit and said "maybe we should turn around" as he was a little nervous about the legality of being on the roads in a car. I told him, its cool plenty of people do this, get out. I climbed into the drivers seat and went. 40mph felt like 100, the car was responsive, slightly tail happy, and so alive! splashing through puddles, flying down this road, sliding through corners. We were laughing harder than ever before the whole time. We turned down this side road and were flying down that one too, until we saw a ravine. We stopped, and looked at each other and smiled. I threw the car into reverse and plunged in, dreaming of open course drifts and rally cross style races. This is where the problem came in. You see, this ravine was made up of deceptively loose.. sand.. 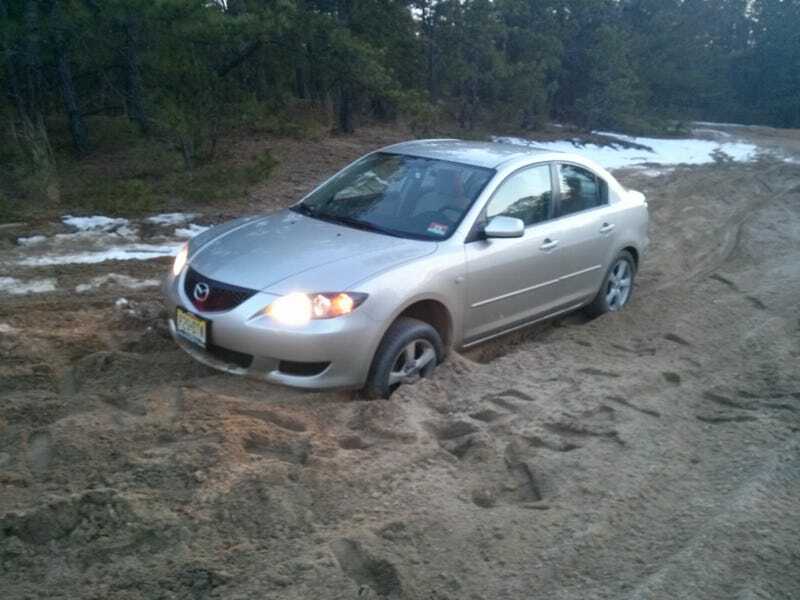 I felt the car get a little stuck and decided to get the hell out of there, so i started to move towards the exit... "annnnndddd we're stuck.." were the words i uttered as the mazda 3 dug its way into the sand. We got out and just laughed for a few minutes.. and i took the picture. then we started to dig, assuming that we could get the car out and then continue on our way. The laughter stopped after the first hour of being in that hole. We attempted to dig the car out, and it dug its way back in. we put wood under the wheels, didnt even make a little difference, we put a canvass under the wheels, no luck. Finally we decided to call for help, as the sun was rapidly setting. My friend, Ben, called his mother, who freaked out. His phone then died, but mine still read 30%, so we called 911. they patched us in to a park ranger, who gave us some phone numbers for tow trucks. Not a single company was willing to come out. The Time was about 7:45, my phone died after we told the park ranger we are broke. About 45 minutes later he came down to see us for the first time. "Why the hell did you bring a car down here" was all he said, starring in disbelief and the captured, sunken mazda. He then notified us of the inevitable, If a truck comes to get us, they're gonna charge us $200-$300 easily to get us out, and demand payment immediately. This freaked us out, and my new catch phrase became "I have 8 bucks.." my friend had none. Then we see lights behind us, and a guy approached us. My friend asked "are you the tow?" "no, i am not the tow.." we were concerned.. Turns out this random passer by, with a king ranch, has a rope! He yanked the Poor mazda out, and gave us his phone to use. Ben called his mother, who had been quite busy making the trek down to the area and working to help find us. He showed us the way to her and left us with the parting message "stay the hell out of the forest"
We were at his house by 10, and i was home by 10:15. This was remarkable, as we were both gearing up to sleep in the car for the night. SO! lesson time.. i dont think we fully learned ours.. We plan on going back, but not any time soon. When we go back, it will be with my car, on ghetto rally suspension to raise it and used rally tires. We will also be bringing my mothers Toyota 4runner, just in case. but.. my car is... *gulp* an Fc Rx7.. lol. but i will raise it on convertible Rx7 springs, and maybe custom strut perches, but im slightly nervous now.. apparently, if we continued up the path we were on, we would have hit more sand just like it..
We will see lol, but we are definitely not done there!